Cact. Succ. J. (Los Angeles) 18: 56. 1946 as "A. denegri"
Život v Přír. 29(2), 14 [Kakt. a Succ. 3] fig. (1925); cf. Gray Herb. CardCat., Issue 114. 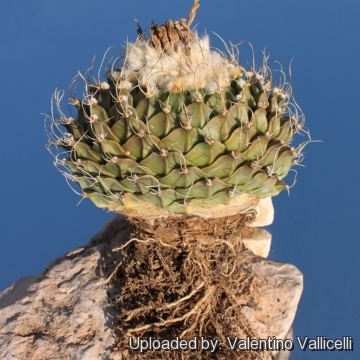 This is one of the rarest and highly desirable of the living rock cactus, very characteristic and unmistakable. 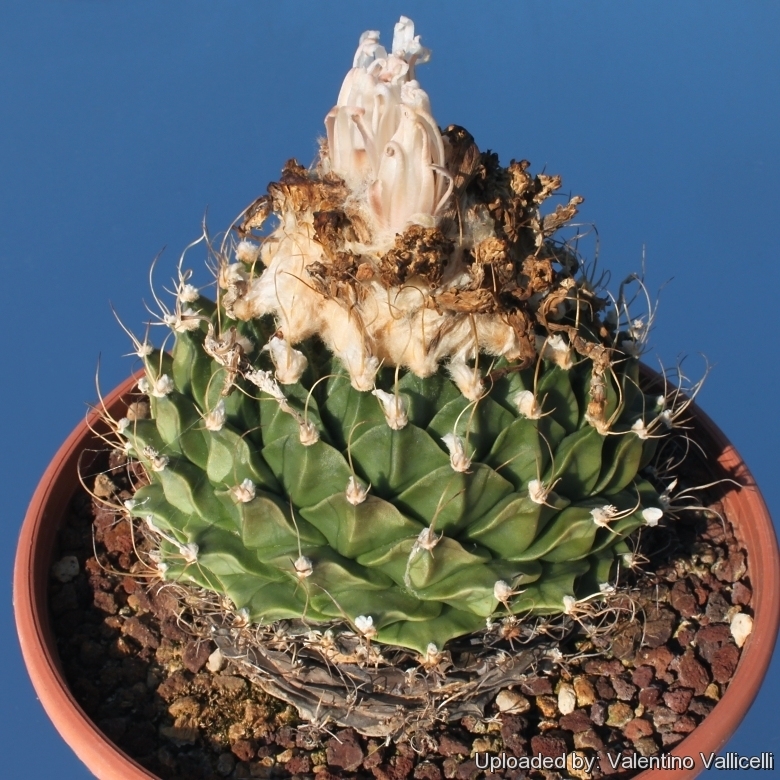 somewhat similar to Ariocarpus, it resembles an inverted green pine cone with a woolly centre. Origin and Habitat: Obregonia denegrii has a very small geographic range near Ciudad Victoria in the Valley of Jaumave, Tamaulipas, Mexico (extent of occurrence approximatively 2,000 km2, area of occupancy 350 km² and there are no more than five subpopulations, all of them are found in one location). The population consists of less than 5,000 plants, and it continues to decrease due to collecting. Altitude range: It occurs at an altitude of about 1,000 metres above sea level. Habitat: Obregonia denegrii thrives in semi-desert (or Tamaulipan Shrubland) both in open areas and in dense bushes in the inferior part of a dense forest on lower hill slopes where erosion is a serious problem. Sometimes plant are washed out of the ground by rain. 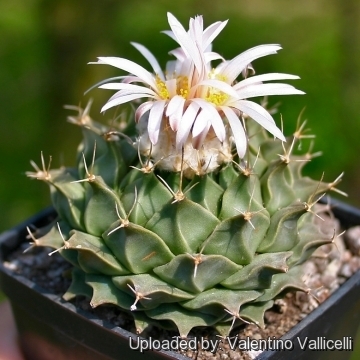 The climate is relatively wet, plants generally grows in limestone soil, among gravel and small stone in association with several other succulent species like Agave lechuguilla, Ariocarpus trigonus, Astrophtum myriostigma, Mammillaria baumii, Neolloydia grandiflora, Coryphantha palmeri, Echinocereus blanckii. The generation length is 10 years. This species has a very small geographic range and ongoing declines due to illegal overcollecting and habitat modification due to grazing. It is also collected by local people for medicinal purposes (used to treat rheumatism). It is also widely cultivated as ornamental. Obregonia denegrii f. aurata hort. Obregonia denegrii f. cristata hort. Obregonia denegrii f. monstruosa hort. 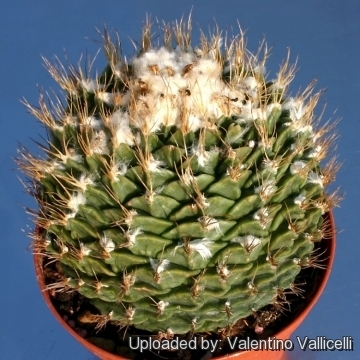 Description: Obregonia is among the most famous of all cacti for is unique artichoke-shaped stem. 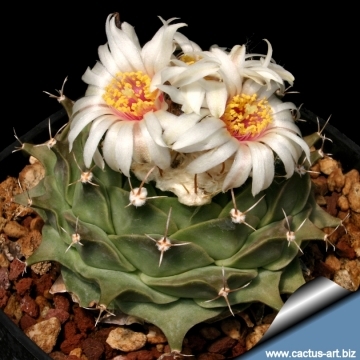 It is the only representative of its monospecific genus and is related to Ariocarpus. It grows almost always as a solitary plant levelled with the ground, with the sunk and woolly apex. 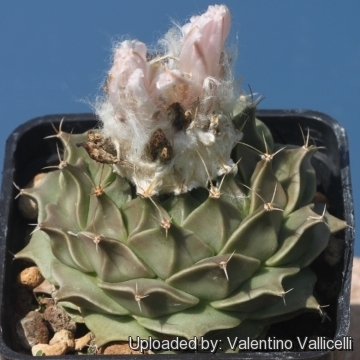 It is considered an intermediate form between Ariocarpus and Lophophora. Stem: Solitary, globular-squashed resembling an inverted pine cone with a woolly centre, it grows up to 15 (or more) cm in diameter and is greyish green to dark green. 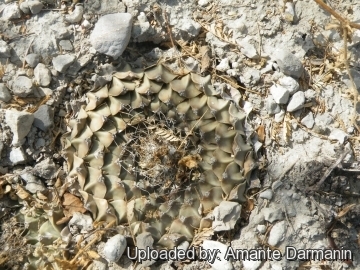 Tubercles: Arising in a rosette, not imbricate, arranged in a spiral, deeply cut like an artichoke, triangular, prominent, leaf like, flat above, keeled below and with a basal ridge. Areoles: Small at the tips of the tubercles, with wool when young. Spines: 2 to 4 whitish to brown about 5 to 15 mm long in the young tubercles, ± soft flexible, slightly curved and often rapidly shedding. Flowers: The flowers grow between the wool of the apex, in the centre of the stem on young tubercles, they are funnel-shaped white diurnal, up to 2.5 cm in diameter, 2.5-3 cm long. External perianth segments greyish, pericarpel naked or with few scales. Filaments reddish purple or pink, anthers yellow, style white and stigma lobes white. Fruits: Hidden in the wool, pear-shaped, white naked, fleshy and edible that dry when mature. The withered flowers remaining attached. Seeds: Large and black 1 to 1.4 mm long. Obregonia denegrii f. aurata hort. : schizochromic form with uniformly yellow stems due to the absence (or very reduced production) of chlorophyll pigments. Obregonia denegrii f. cristata hort. : crested form. The stem which is fan shaped up to 30 cm (or more) long with age. Obregonia denegrii f. monstruosa hort. : monstrous form. Has a free branching habit (Obregonia denegrii is always solitary) with stocky, rounded tubercles with woolly white areoles, the spines are also shorter. 6) Gómez-Hinostrosa, C. & Guadalupe Martínez, J. 2013. "Obregonia denegrii." The IUCN Red List of Threatened Species. Version 2014.3. <www.iucnredlist.org>. Downloaded on 20 December 2014. Cultivation and Propagation: This slow growing plant isn't always the easiest species to cultivate, but can enlarge relatively fast when well grown. It is often seen as a grafted plant but grows very well on its own roots too. Needs a very well drained mineral substratum with little organic matter (peat, humus). Requires light sun sun to develop good compact growth and waterings should be rather infrequent, to keep the plant flat shaped and not become excessively elongated and unnatural in appearance. Use Water sparingly from March till October and keep perfectly dry in winter, or when night temperatures remain below 10° C (but some people give this plant a light monthly watering to prevent the drying and shedding of the lower tubercles.) It is hardy to -4°C (or less) for a short period. In the rest period no high atmospheric humidity!! Ensure a good ventilation. Propagation: Almost exclusively by seeds. But the seedlings are tiny and very slow growing and at first they take one or two years to reach the diameter of 3-5 mm!!! Once they have reached 4 years old or more they are relatively easy to grow, the problem is getting them to 4 years old! 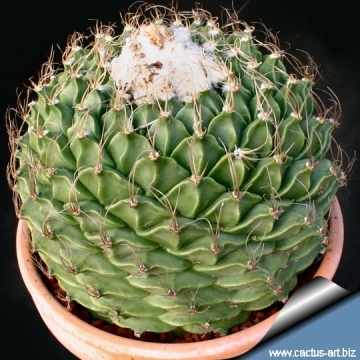 Than they reach 5 cm of diameter in about 5-6 years, and require very careful watering. Plants need about 7-8 years to reach the flowering size. 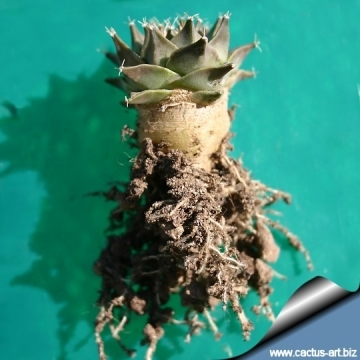 Seedlings are sometimes grafted onto column-shaped cacti to increase their growth speed. Grafting is a much easier way of propagation than sowing.